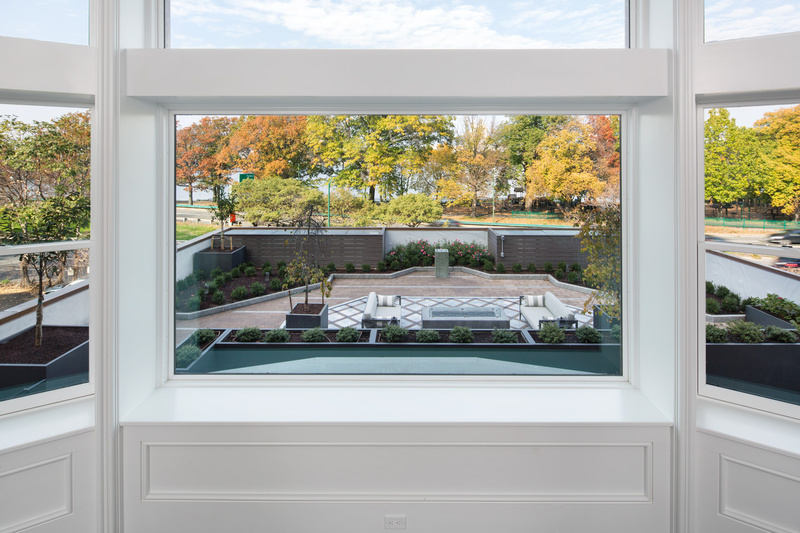 Warner Larson worked with Hacin + Associates Architect and Congress Group to design a common roof deck for the 5 luxury condominium units at Hooper Mansion located at 448 Beacon Street. The building was one of the largest buildings in Back Bay when it was constructed in 1889 and was commissioned as a private residence for Robert C. Hooper and his wife. 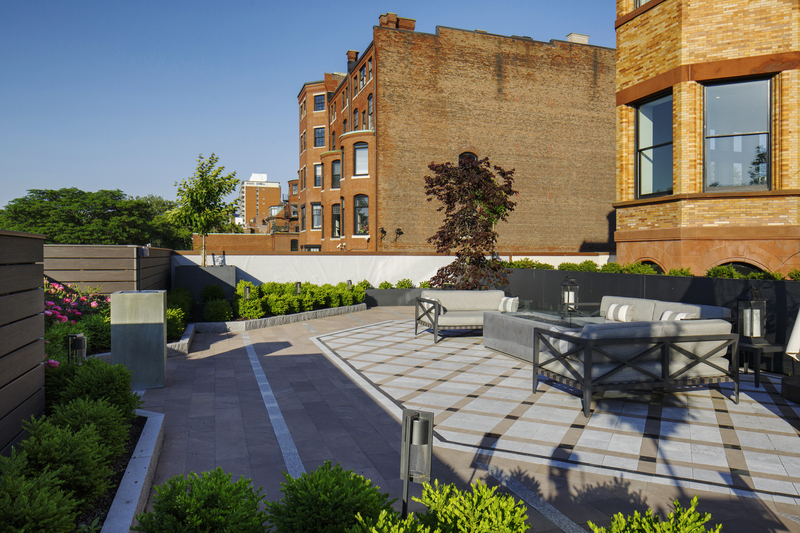 Honoring the rich architectural period details and bringing it to the 21st century modern living, the design for the roof deck echoes the richness of the past in material selection and pattern of the pavers but giving it a contemporary flair with site furnishings and accessories. 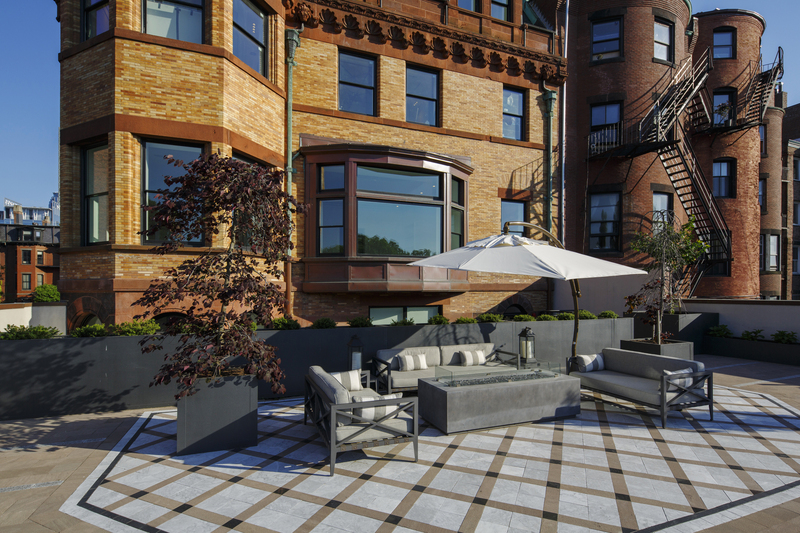 The central diamond weave paving pattern mimics a luxurious rug while but the comfortable lounge seating encourages socialization and is positioned to offer unobstructed views of the Charles River Basin. The four Cherry trees in planters frames the space while providing season interest. The rest of the planting is inspired by the French parterre with low clipped boxwood hedges providing visual interest for units above. A fountain amidst a bed of English roses provides tranquil soothing sound offsetting the road noise. Up-lighting of the trees, path lighting and the fireplace which doubles as a coffee table offers the perfect ambience for evening get-togethers or hosting private parties.